Here a Volt, there a Volt. Car-buying consumers continue to make the shift to heavier and less fuel-efficient pickup trucks and crossover utility vehicles. As demand for veers to other body styles, both traditional and electric sedans and hatchbacks falls. The Chevrolet Volt is one such EV that consumers have left in the dust. Summer is typically the season for stepped-up new vehicle discounts, especially for departing models that are being canceled or replaced with the next generation version. 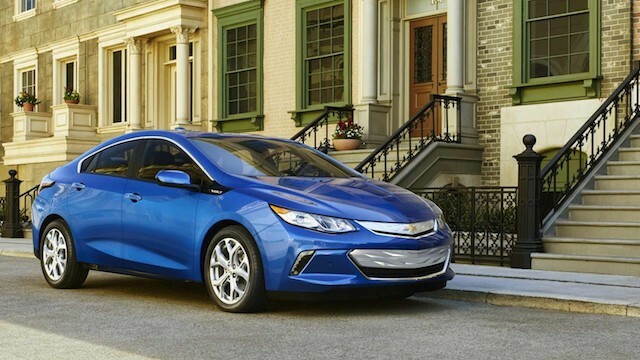 The Chevrolet Volt occupies the latter category, a gas-electric hybrid entering its second generation this fall. Inventories for the first-generation Volt are swollen, with more than 6,000 2014 and 2015 model year vehicles on dealer lots, according to the Detroit Free Press. That number would be manageable if it were the midsize Malibu or compact Cruze sedans, but the figure represents one-third of the Volt’s 18,805 sales in 2014 or four months of inventory. A 120-day inventory supply is long for any vehicle, but could prove downright catastrophic for EVs, such as the Chevrolet Volt. The 2015 edition retails from $34,170, a price that includes $1,000 cash back. However, TrueCar has pegged the average price for the Volt at $31,588. And that’s before a $7,500 federal tax credit and whatever state incentives may be available are taken. By the same token, most Volts are leased. Specifically, rates of $249 per month for 39 months with $500 down or no money down for conquest shoppers (customers who currently own non-GM vehicles) are available in some markets, such as in northern New Jersey. That being said, the deal covers just 32,500 miles over the span of the lease or just 833 miles per month. Push past that mileage threshold and you will pay 25 cents for each mile. Several auto trends are conspiring to suppress Volt sales. Besides its higher base price compared with conventional models, fuel prices are the lowest we have seen in more than five years. A recent price boost above $2.50 per gallon in most markets to about $3.00 per gallon elsewhere could renew interest in the Volt and other EVs. Yet, new vehicle shoppers continue to make the shift to less efficient trucks and utility vehicles, while demand for all sedans — conventional and otherwise — falls. Another factor is the 2016 Chevrolet Volt itself. The new version offers several improvements over the departing model, including a longer electric-only range (50 miles over the current 38 miles); a lighter battery, what allows for a three-seat row in the rear instead of the previous two; and an improved dashboard interface. Moreover, GM may be undercutting the first-generation Volt, by dangling its upcoming model in front of prospective shoppers. Critics are pointing to higher prices, swollen inventories and a shift in consumer preferences among the reasons why the Volt’s year-to-date sales are down 46.1 percent through April, numbering just 2,779 units sold. Some also are openly questioning GM’s decision to proceed with the Chevrolet Bolt, an all-electric vehicle that comes to the market in 2016. That being said, GM is responding in much the same way as other manufacturers are when faced with a federal regulatory environment requiring all automakers to attain a 54.5 mpg fleet average in 2025. Thus, it is only through an assortment of electric vehicles that car companies will meet those goals. And unless gas eventually reaches $5 per gallon, that mandate will collapse and a number of EV schemes may wither with it. Chevrolet Volt photos courtesy of GM.